Do you have Christmas News for Prim Perfect? This is your chance to submit news for Prim Perfect’s summer issue, which will be out shortly – and at the moment we are looking for news stories to feature in our popular News from the Grid feature. If you have a news story to share about your store or your sim, you can use the special Prim Perfect news service, to submit your news story directly to the magazine. 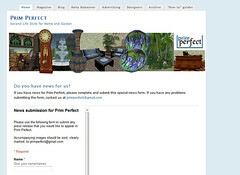 All you have to do is to go to www.primperfect.net/news_form.html and complete the simple form. If you want an image included, send it to primperfect@gmail.com. To appear in our next edition, we must receive your news story by 1 am SLT, Saturday 15th December, 2012. The news story may also appear on this blog, especially if the story concerns, for example, the kind of time-defined event we like to cover – a special store promotion, or a charity concert. So what are you waiting for? Send your news to us – and see it in print very soon! Previous Post: Designing Worlds pays a seasonal visit to New Babbage – what could possibly go wrong?